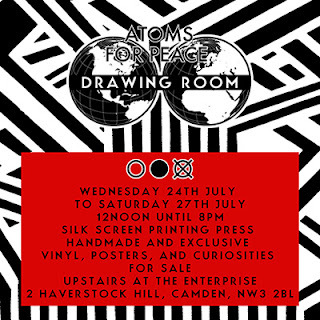 Atoms For Peace, Thom Yorke's band, are appearing at The Roundhouse later this week, and to coincide with this are opening a 'Drawing Room' above The Enterprise pub, opposite the venue, for four days only, to show and sell art work and rarities, and also live printing on a screen printing press. It's been created by Stanley Donwood, who has done the artwork for almost all of Radiohead and Atoms For Peace's works. You can also go there to hang out. 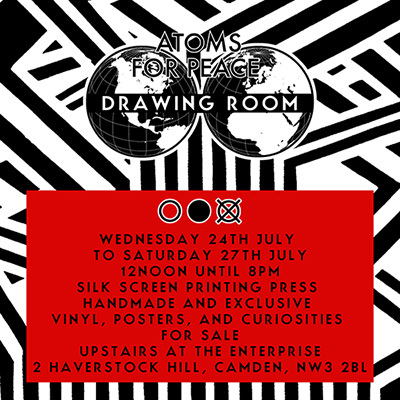 "The Atoms For Peace Drawing Room will will take over the upstairs room of The Enterprise – located just over the road from London's Roundhouse – to mark Atoms For Peace's three night residency at the legendary venue. Part-gallery, part-shop and part hanging-out space, it will feature handmade and exclusive vinyl, posters and curiosities for sale, many of which will be ‘live printed’ in the Drawing Room on a specially-installed silk screen printing press."